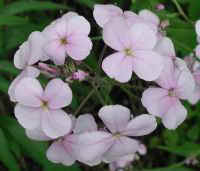 (Dame's Rocket (Hesperis matronalis) - 01) The dame's rocket is similar to phlox, and many people confuse the two. 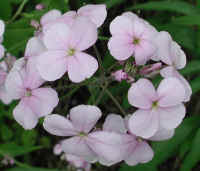 The dame's rocket flowers have 4 petals, and phlox flowers have 5 petals. 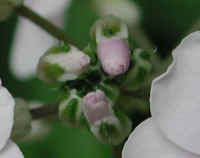 This is an example of the white flower, but dame's rockets can be violet or pink, and can also have a blending of colors, as the following photos will present. 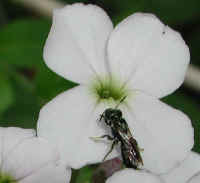 (Dame's Rocket (Hesperis matronalis) - 01a) This is a closer look at the wasp at work collecting pollen and fertilizing the dame's rocket. 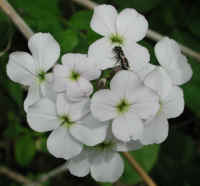 For size comparison, the diameter of the dame's rocket flower is about 2 cm. (3/4 inch). 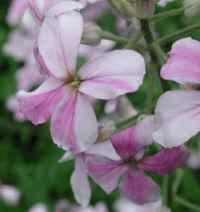 (Dame's Rocket (Hesperis matronalis) - 02) In the foreground are mostly white dame's rocket flowers with some light purple or violet veining. 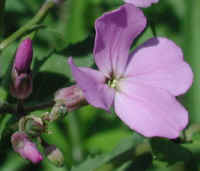 Darker violet flowers can be seen in the background. 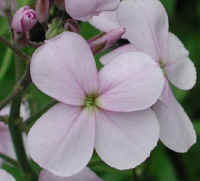 (Dame's Rocket (Hesperis matronalis) - 02a) Even though the flowers of this dame's rocket are nearly white, the buds are a deep pink. 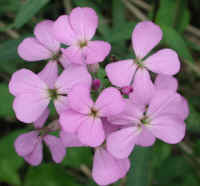 (Dame's Rocket (Hesperis matronalis) - 03) These dame's rocket flowers are good examples of the pinkish violet color. (Dame's Rocket (Hesperis matronalis) - 03a) In this close-up view of the dame's rocket, we can see one of the buds beginning to unfurl. 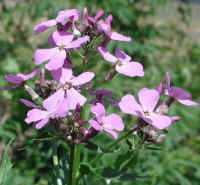 (Dame's Rocket (Hesperis matronalis) - 04) This is another look at the dame's rocket flowers and buds. 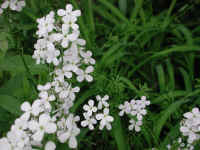 (Dame's Rocket (Hesperis matronalis) - 05) This is a small patch of dame's rockets that are growing next to a wild rose (left). (Dame's Rocket (Hesperis matronalis) - 05a) In this photo of the dame's rocket, we can see the lanceolate toothed leaves that grow alternately along the stems. Mature leaves vary in size from 5-10 cm. (2-4 inches). 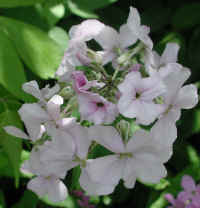 (Dame's Rocket (Hesperis matronalis) - 06) The dame's rocket, a member of the mustard family, can grow to heights of 1-1/2 to 4 feet. (Dame's Rocket (Hesperis matronalis) - 06a) The dame's rocket is listed as a noxious weed by the United States Department of Agriculture, a classification we find to be ludicrous when one takes the time to look at its beauty. We would love to have a patch of dame's rockets in our own yard. 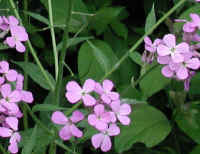 (Dame's Rocket (Hesperis matronalis) - 07) The flowers of the dame's rocket grow in terminal racemes (each flower has its own little stalk branching off the main stem). 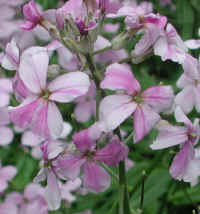 (Dame's Rocket (Hesperis matronalis) - 07a) This is another side view of the dame's rocket racemes. 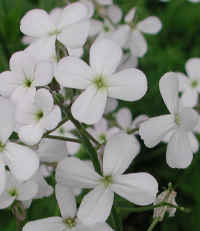 (Dame's Rocket (Hesperis matronalis) - 08) This is another look at nearly white dame's rocket flowers. 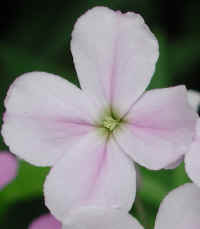 (Dame's Rocket (Hesperis matronalis) - 09) A light pinkish violet dame's rocket bud unfurls its petals. (Dame's Rocket (Hesperis matronalis) - 09a) A bud and flower of the dame's rocket present their beauty to all who pass by. 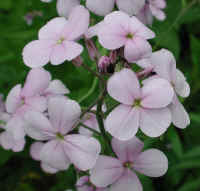 (Dame's Rocket (Hesperis matronalis) - 10) The dame's rocket is a native of Europe that was imported to New England in the 1600s and rapidly spread across the United States and Canada. 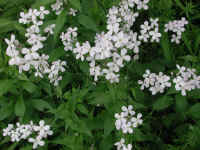 (Dame's Rocket (Hesperis matronalis) - 11) A small patch of dame's rockets growing adjacent to a patch of day lilies (without flowers). (Dame's Rocket (Hesperis matronalis) - 12) In this patch of dame's rockets, we get a good look at the leaves of this wildflower. 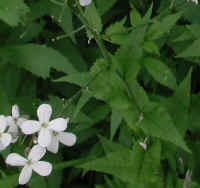 (Dame's Rocket (Hesperis matronalis) - 12a) In this photo, we can get a closer look at the lanceolate leaves growing alternately along the stem. 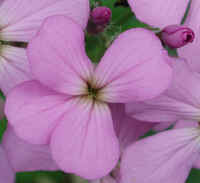 (Dame's Rocket (Hesperis matronalis) - 13) These dame's rocket flowers look as if they were air-brushed with a touch of pinkish purple. Most of the color emanates from the central veining. 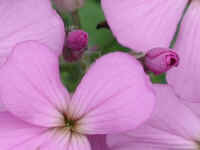 (Dame's Rocket (Hesperis matronalis) - 13a) This photo presents a closer view of the delicate coloring of these dame's rocket flowers and the contrasting bright pink buds. 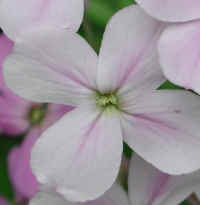 (Dame's Rocket (Hesperis matronalis) - 14) This is a top view of the dame's rocket flowers. (Dame's Rocket (Hesperis matronalis) - 15) We found the bi-coloration of these dame's rocket flower petals to be unusually beautiful. (Dame's Rocket (Hesperis matronalis) - 16) Moving back a little from the previous close-up, we can see the much deeper coloration on the lower flower. 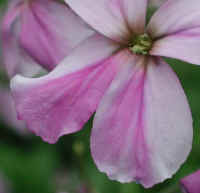 (Dame's Rocket (Hesperis matronalis) - 17) This is a side view of the bi-colored dame's rocket. 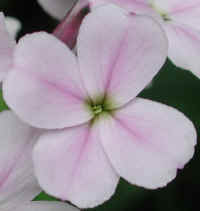 We saw nothing in the literature concerning this type of dame's rocket coloration. 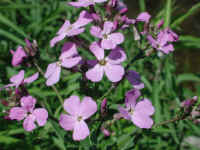 (Dame's Rocket (Hesperis matronalis) - 18) This is a closer look at the pinkish purple blush coloration of a dame's rocket flower. 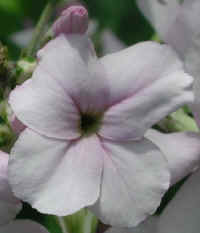 (Dame's Rocket (Hesperis matronalis) - 18a) Like human fingerprints, each flower petal seems to be unique. No two are exactly alike. 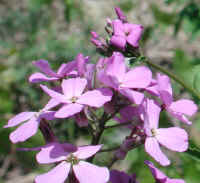 (Dame's Rocket (Hesperis matronalis) - 18b) And this dame's rocket flower is no exception. 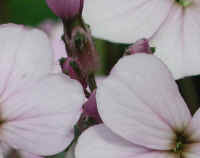 (Dame's Rocket (Hesperis matronalis) - 19) This is a bee's eye view of the center of one of the dame's rocket's 3/4 inch flowers. (Dame's Rocket (Hesperis matronalis) - 20) This is another look at the beauty of a few of the dame's rocket flower buds.